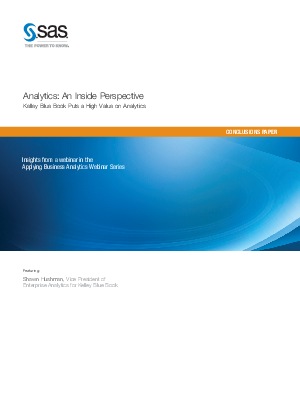 In this webinar conclusions paper, Shawn Hushman, Vice President of Enterprise Analytics for Kelley Blue Book, describes how his company embedded SAS® Analytics into all those facets of the business - creating a culture of analytics by gaining the necessary executive commitment, analytics talent, technology infrastructure and workflow.
. Dimensionalized Multivariate Testing. What happens if you change an element on a Web page, add or remove an advertisement, or otherwise modify the way a Web page performs? Multivariate testing will enable side-by-side analysis of multiple versions, not just A/B versions. A dimensionalized view will clarify how the changes permeate the rest of the website. How will a change affect other areas or attributes of the site, or the choices visitors make? With this capability, analysts will be able to define appropriate samples to run multivariate tests on multiple areas of the website.
. Market Structure Analytics To Predict Switching Behavior. If you chart the various clicks and hops visitors can make as they browse your website, the result looks like a spider web of interdependent options and routes. How would switching behavior flow differently if you modified something on the website?